This story was updated at 9:59 a.m. ET. HOUSTON – A minor spacesuit leak briefly stalled two astronauts planning to venture outside the International Space Station today (March 2) on what will be the last spacewalk of their mission to the orbiting laboratory. The leak was discovered in the spacesuit worn by shuttle Discovery astronaut Steve Bowen during a routine check before the start of today's spacewalk. Bowen and his crewmate Alvin Drew are taking the mission's second spacewalk today to perform a variety of tasks to upkeep the station. Bowen was not in any danger during the leak, NASA officials said. But the glitch did push the spacewalkers about 15 minutes behind schedule. 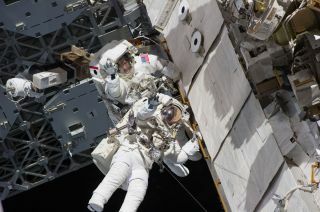 Bowen and Drew were slated to start today's spacewalk at 10:18 a.m. EST (1518 GMT). Shuttle astronaut Mike Barratt and space station astronaut Paolo Nespoli were helping Bowen into his suit inside the station's Quest airlock when they noticed the issue. They traced the leak to a faulty seal on the air-scrubbing lithium hydroxide canister in Bowen's suit. The canister helps remove carbon dioxide from the air inside spacewalkers' suits. Barratt and Nespoli retrieved a replacement seal inside the Quest airlock and inserted the new one in the lithium hydroxide canister. The substitute seal passed all subsequent leak checks. Discovery, NASA's most traveled space shuttle, is making its final flight on this mission before being retired along with the rest of the shuttle fleet later this year. The 12-day mission is delivering a storage room and humanoid robot to the station.